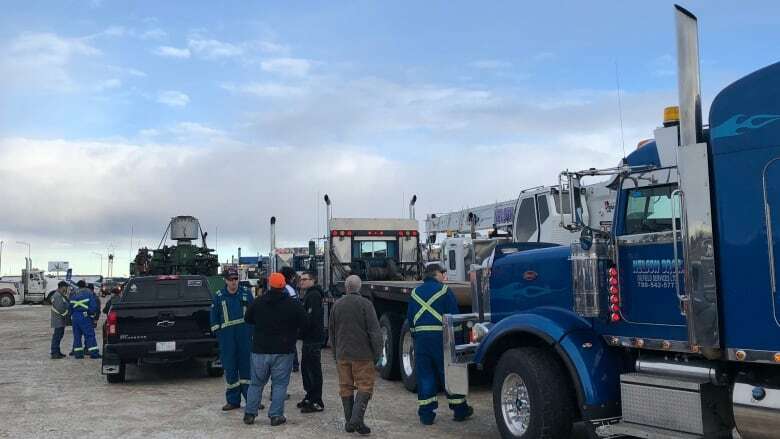 Convoys of trucks rolled slowly through Alberta and Saskatchewan on Saturday as demonstrations in support of Canada's ailing oil and gas sector continue. Police in Medicine Hat, Alta., estimate that 650 vehicles took part in a convoy that began on the Trans-Canada Highway east of the city and continued west to weigh scales before turning around and dispersing. A similar event in Estevan, Sask., brought around 450 trucks, according to a police estimate. Truck convoys began last weekend in Alberta. One event on Wednesday brought more than a thousand vehicles to Nisku, south of Edmonton. Jerry Sabine, an organizer of the convoy in Medicine Hat, says trucks were driving slowly to show people "the frustration of how slow the oilfields are." Saskatchewan Premier Scott Moe tweeted his support for the event in Estevan, saying people across Western Canada are fed up with what he called the Trudeau government's indifference toward the energy sector. "What a strong message sent today from the truck rally in Estevan," Moe said. "Your SK government stands with you in support of this critical industry." Other recent rallies, including a large one in Calgary on Monday, have targeted federal actions that critics say will make building pipelines more difficult. They include Bill C-69 to revamp the National Energy Board and Bill C-48 which would ban oil tanker traffic on British Columbia's northern coast. Supporters of Saturday's convoys lined the streets in both cities. Most of the signs they held had messages calling for pipeline construction, an end to carbon taxes and the defeat of Prime Minister Justin Trudeau. A few of the signs also expressed opposition to the United Nations. Jay Riedel, an organizer of the Estevan convoy, said concern over Canada signing the United Nations migration pact is part of the protest, noting he believed the pact surrenders Canada's immigration policy to outside powers. "We definitely need immigrants coming into Canada but we also need to get jobs going for us and them," Riedel said. "If we don't have jobs for these people to have, then our whole social system is going to fail." Police in Medicine Hat and Estevan commended the conduct of the convoy drivers. "Appreciate the public's patience during the truck convoy protest. Also appreciate the professionalism of those involved," said a tweet from the Estevan police that was attributed to Chief Paul Ladouceur. More convoys are planned, including one that will travel to Ottawa in February. Sabine said some of the trucks involved in the Medicine Hat convoy travelled from across the province to support the event. "We just put the word out a couple, three days ago, and it really snowballed on us," Sabine said.